Year by year Gaming Desktop are getting cheaper to build.For just a budget price you get some serious gaming hardware and start playing your favorite titles on it.The article is about building your Custom Gaming Desktop. well if you’re not in mood for that, then you can go out and fetch yourself a readymade Best Gaming Desktop Under 1000 Dollars. However you don’t have full control of what you get and it’s much cheaper to get a custom build desktop with all the components you need. In our Best Gaming Desktop Under 1000 Dollars built is an entire setup where just under $1000 you get the entire system, so you don’t have to shell more on other important things. This is the top line model in Intel’s Core i5 lineup and is considered Best CPU for gaming for building cheap gaming desktop computers. ‘K’ in its model name indicates that this processor is specifically meant for overclocking and allows you to squeeze more performance out of it. It’s a Quad core processor with 4 threads that offers great gaming experience and ultimate performance during Image and Video editing sessions. The processor is definitely meant for Overclocking, however the stock heatsink isn’t meant to handle that kind of stress… hence it’s highly recommended to get an aftermarket heatsink like the Cooler Master Hyper 612 for best gaming experience for our Best Gaming pc under $1000. Well if you want to keep your CPU’s Temp to very minimum and still overclock it upto 5GHz then you can treat your Intel Core i5 4690K with Corsair Hydro H60 Water Cooling solution. If you want a Motherboard that comes packed with tons of features at an affordable price to compliment our Best Gaming PC under $1000… then this is it. It comes with top of the line Z97 chipset that is meant for enthusiasts; with LGA 1150 socket. The Asus Z97-A also shows support for DDR3 memory with 2600MHz of frequency. Design chosen by Asus on this board is minimalistic compared to its other older iteration of motherboards, it now comes with a full blacked out design with small accents of grey and gold. Wanna know all the features in this motherboard… then do see the video below to get full idea about what it has to offer. Since its a Full-ATX motherboard… just make sure to get yourself a Full-ATX case. However don’t worry as we’ve listed one down below in our guide on Best Gaming Desktop under $1000. Crucial is a popular name when it comes to gaming specific RAM. Crucial Ballistix Sport 8GB RAM – Best gaming desktop under 1000. The one we have here is their Ballistix Sport 8GB version meant specifically for Enthusiasts and Mainstream user who like to take things to extreme version. You also have Aluminum cover on these RAM sticks so as to spread heat in proper way. If 8GB is not your kind of thing… you can treat yourself with Kingston’s HyperX Fury 16GB RAM sticks clocked at 1866MHz for your Best Gaming Computer under $1000. The Geforce GTX 950 is the newest GPU from Nvidia to replace its GTX 750 and 750Ti. 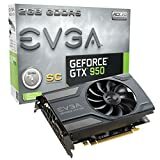 With only slight performance difference compared to its bigger brother GTX 960, the GTX 950 is cheaper and offers best performance while being very quiet doing so. It is the closest competitor to AMD’s R7 370 and R9 270X GPU while being slightly better in performance. Specifications wise you get 1190 MHz Base Clock and 1393 MHz Boost Clock. 2GB (GDDR5) gaming RAM along with 6610MHz Memory Clock. 768 CUDA cores along with Memory bit of 128 bit and Memory Speed of 0.28 Nano Seconds. Since it’s a Mid Range Graphic Card you don’t need a lot of Power to drive this. Just a 600W SMPS is more than enough. The EVGA GeForce GTX 950 is an ideal graphic card for 1920x1080p gaming resolution with Medium to Ultimate Gaming Profile. Performance wise you get 42 Average FPS with Crysis 3… whereas the AMD’s R9 270 manages 37 FPS. With Tomb Raider 1920x1080p with Very High Settings you get 80 Average FPS on this… while you have 47 FPS with Far Cry 4 @ 1080p and at Ultra Settings. Since any game that offers more 24 average FPS seems smooth to our eyes… you’ll be getting great performance with the EVGA GeForce GTX 950 at cheaper price compared to its competition. The company even claims, no noise while being idle and 26% More Cooler, 36% More Quieter. Since you want the Best Gaming Desktop for the money, you also need a Computer Case that will compliment your Best Gaming Desktop Under $1000. This computer case by Corsair comes with 2x 120mm front LED Fans and 1x 120mm rear exhaust fan, it also has support for 2x 140mm fans at top and 1x 140mm fan at bottom. This means that keeping your desktops innards won’t be a problem at all. Corsair Graphite 230T offers USB 3.0 at front panel and Tool-free SSD, HDD, ODD installation. It provides support for GPU’s as long as 320mm and one can install upto 4x 3.5” drives and 4x 2.5” drives. However if you have space for more and feel the need for a Full-Tower ATX Case: Consider the Thermaltake Chaser MK1 or more stylish and minimalistic NZXT Phantom that are popular choices among die-hard gamers. What would a Best Gaming PC under $1000 be without a powerful and stable Power Supply Unit. It’s an 80 PLUS Gold Certified SMPS with upto 90% efficiency under typical loads. 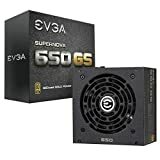 The EVGA SuperNOVA 650W is such a powerful PSU that it has received 4.7 stars on Amazon.com from over 1000+ customers. While choosing a PSU, do keep in mind if the power supply you’re buying is GOLD certified rather than Bronze certified because Bronze Certified PSU’s are cheaper with less efficiency. You definitely need huge space to store your big gaming titles along with movies, music and videos. Since we’re building a Best Cheap Gaming PC, I believe just a 1TB HDD would be enough. However if you want to go a little overboard in the Storage department, you can treat yourself with 250GB Samsung EVO SSD and 2TB Seagate HDD so as to never run out of space along with great speeds with the SSD drive. What’s the fun of having best gaming desktop configuration and going for a small LED display. Even if you get a big display, they tend to have poor viewing angles. 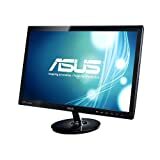 Asus 23 inches IPS LED Gaming Monitor – Best cheap gaming PC Hence keeping that in mind I’ve featured an IPS display that will definitely offer optimum Contrast Ratio along with larger viewing angles. Hence you’ll get the kind of screen quality we usually see in our smartphone screen. However since we’re building a Best Gaming Computer under $1000, I didn’t wanted to go overboard with the monitor. It has glossy plastic covering on its bezels and base, however the screen has matte finish… that reduces glares and eye strains. With this Asus Monitor you get HDMI, DVI and VGA input with it. It’s definitely not the top of the line or an incredible feature filled monitor… however it will surely get the work done. Do check out its full review. However if you don’t care about the IPS display, are ready to spend more and want incredibly crazy response time of 1ms… then Benq’s 24-inches Gaming Monitor is specifically meant for you. Mechanical Keyboards are Holy Grail when it comes to building a Gaming PC. Razer Blackwidow Standard – Best Gaming Computer under 1000. Razer’s Blackwidow Standard Edition is the cheapest Full-Size Mechanical Keyboard. You also get certain programmable buttons toward its left. It has a full black overall look… however with no backlighting. Even the button make noise while typing and playing game, still it’s the most cheapest mechanical gaming keyboard available right now to compliment our Best Gaming Desktop Under $1000. There’s also a backlit version available at around $100 and a cheaper Tournament Edition at $70 that comes without a number pad. If you want to take a look at the most popular gaming mouse for your Best Gaming PC under $1000, then here it is: the Logitech G502 Proteus Core. The design isn’t as gaudy as we’re used to seeing on gaming mouse. The G502 has nice design with nice thumb rest and rubberized sides. You get 11 programmable buttons that allow easy shortcuts while playing games. Its obviously one of the better gaming mouse I’ve seen so far that allows you to tune it to your liking and change DPI from 200-12,000 at ease. Even you get backlighting at G logo that totally looks cool. If you want the best experience for your Best Gaming PC under $1000, Logitech G502 Proteus Core is your best bet. Do check out it’s full review by clicking here. If you calculate prices of all 10 components mentioned in our built of Gaming PC, you’ll see the price reaches upto $1059 as of this time of writing. The price is definitely slightly off our margin, however it’s still doable. Do let me know your thoughts about this built and what are the components you think should be added or removed from our built. Do let me know your thoughts about our Best Gaming PC under $1000 in the comments section. If you liked what you love, please do consider sharing this article with your friends on social media services like Facebook, Twitter, Google+ and so on. Thank you for visiting our website, do keeping hanging out again and again.